M T D D e c e m b e r 2 0 1 8 54 2 0 1 8 A A P E X K nowing the vehicle issues that may be coming into their shops can help techs plan training, stock parts and have appropriate service tools ready. Such data is available at Technician Nation, a free online community. 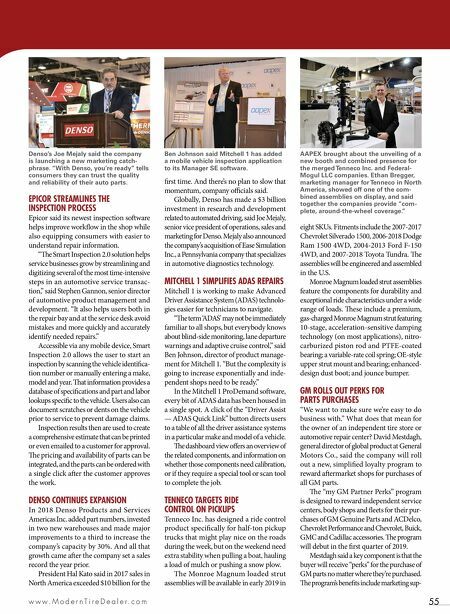 "Every user of a scan tool powered by Bosch is providing us with insight on vehicles worked on around the nation," Alison Accavitti, Technician Nation publisher and marketing communications manager, told Modern Tire Dealer at the 2018 Automotive Aermarket Product Expo (AAPEX). Robert Bosch LLC created Technician Nation to be a resource for addressing vehicle issues. e online and on-tool platform includes a dashboard aggregating nationwide service trends that can be segmented by geography, vehicle and code, based on vehicle scans from technicians using diagnostic tools powered by Bosch. e dashboard reveals trending vehicle issues in a shop's area and can be used to identify if vehicle problems are trending locally or nationally and provide the best information to help properly diagnose the vehicle. Knowing the geographic occurrence of specific vehicle codes can help technicians to plan for tool and equipment purchases, to anticipate the training they will need, and to validate vehicle issues with customers. "ere is no other dashboard that tells out-of-warranty vehicle service trends," said Accavitti. Anyone can sign up to join the Techni- cian Nation platform, and technicians who currently use a Bosch diagnostic tool or an OTC tool with Bosch hardware will have access to sign up for the e-newsletter through their current soware. A MANAGEMENT TOOL FROM ADVANCE AUTO PARTS Professional technicians across the coun- try have a new tool to help them manage multiple facets of their business in a single spot, whether it's ordering parts, offering promotions or accessing customer sup- port. MyAdvance is available to aermarket customers nationally. Via the MyAdvance (advancepro.com) web portal, Advance Auto Parts Inc. has created a one-stop tool to help professionals manage their businesses. MyAdvance was designed with feedback from customers, and provides access to more than 30 business programs and services. Key benefits include: mobile friendly capabilities for the shop owner or employee, the ability for customization for each shop based on its programs, an "expert corner" with training and business solution advice from leaders in the automotive aermarket, and a feature where users can submit support requests and troubleshoot directly with the Advance staff. "e MyAdvance website improves the way professional customers interact with our team members, and enables them to interact digitally with Advance and among themselves in new ways," said Walter Scott, senior vice president of professional market- ing and programs. CarMD ENTERS THE B2B WORLD CarMD.com Corp. is jumping into the business-to-business market with its first product designed for the aermarket, the CarMD Pro Scan. e hardware plugs into a vehicle's OBD port, and while a technician performs the customary visual inspection, the Pro Scan checks all of the vehicle's systems for signs of a problem. When the scan is complete, the results are compiled into a report that provides an overview of the vehicle's health. at report covers an overview of freeze frame, I/M status, network scan results, OBD II codes, pending DTCs, possible causes, upcoming maintenance and predicted diagnostics. It spots potential repairs before a warning light appears on the dashboard. Shops can customize the reports to feature their logo, and incorporate coupons for upcoming maintenance or service needs. ere's even an option for an instant coupon a consumer could use immediately on a needed repair. "As vehicles become more reliable, customers bring their cars into the shop less frequently, which is why it is vital to help shops capitalize on each visit," said Jim Dykstra, vice president of business development and strategy for CarMD and CEO of Dytech Auto Group. "e CarMD Pro Scan solution is designed to help take care of customer cars more fully than with just a visual inspection by finding hidden work to drive sales." CarMD has also partnered with Epicor Soware Corp. Epicor's Smart Inspection 2.0 will be integrated with the CarMD Pro Scan. 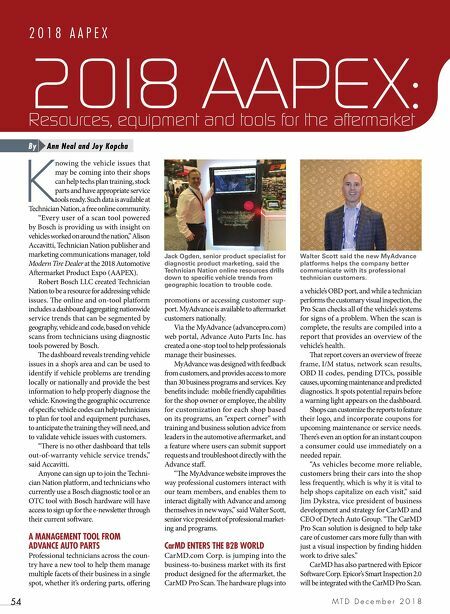 2018 AAPEX: Resources, equipment and tools for the aftermarket Ann Neal and Joy Kopcha By Jack Ogden, senior product specialist for diagnostic product marketing, said the Technician Nation online resources drills down to specific vehicle trends from geographic location to trouble code. Walter Scott said the new MyAdvance platforms helps the company better communicate with its professional technician customers.